Crocker Range or Banjaran Crocker, divides the coast in the west of Sabah from the valleys in the interior. The Crocker Range Nature Park which was established in 1984 and recognised as an Endemic Bird Area and Important Bird Area (MY20), is located about 144km from KK. 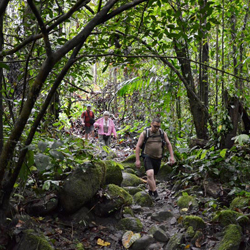 It is the largest state terrestrial park covering an area of approximately 180,000 ha and lays claim to having Mount Kinabalu within its enclave. Also situated within this range is Mount Alab (1,964m). Mountain Serpent Eagle, Bulwer’s Pheasant, Straw-headed Bulbul, Bornean Bristlehead, Whitehead’s Spiderhunter, Bornean Treepie, Mountain Barbet, Bornean Barbet, Long-tailed Broadbill, Bornean Leafbird, Bornean Bulbul. Mount Kinabalu is Sabah’s, if not Malaysia’s, most recognisable natural wonder, and it is located within the Kinabalu Park, about 90km drive from KK. The park is one of the most popular destinations in Malaysia for birdwatchers keen on montane and endemic birds of Borneo. 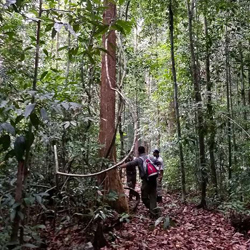 Established in 1964, it is Malaysia’s first World Heritage Site, designated by UNESCO in 2000, and covers 754 sq km of lowland, montane and cloud forest as well as sub-alpine vegetation closer to the mountain peak. It boasts 326 species of birds, 23 of which are endemic to this area including the. 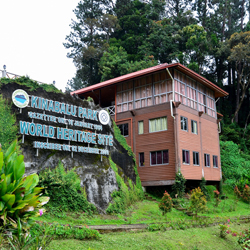 The Kinabalu Park headquarters sits at a height of 1,563m and offers extensive trails to explore. Red-breasted Hill Partridge, Crimson-headed Partridge, Mountain Serpent-Eagle, Whitehead’s Broadbill, Whitehead’s Spiderhunter, Whitehead’s Trogon, Bornean Barbet, Goldennaped Barbet, Mountain Barbet, Fruithunter, Kinabalu Friendly Warbler, Mountain Blackeye, Everett’s Thrush, Mountain Wren-Babbler, Bornean Stubtail, Chestnut-crested Yuhina, Blue-headed Pitta, Black-sided Flowerpecker, Bornean Laughingthrush, Bornean Whistling-thrush, Chestnut-capped Thrush, White-crowned Forktail, Chestnut-naped Forktail, Blue-banded Kingfisher, Hose’s Broadbill, Whitehead’s Broadbill, Orange-breasted Trogon. 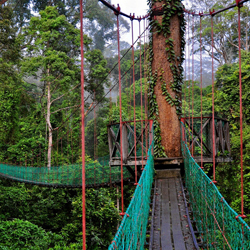 Danum Valley Conservation Area is located in eastern Sabah, about 2.5 hours drive from the town of Lahad Datu. This is arguably one of Sabah’s most important conservation biospheres covering primary lowland rainforest of 438 sq. km. The Danum Valley Field Centre (DVFC) was set up in 1986 for scientific research and education purposes. Danum Valley is an Important Bird Area (IBA MY24) in Malaysia as more than 300 species of birds have been found especially in the areas surrounding the Danum Valley Field Centre and the Borneo Rainforest Lodge which provides luxury accommodation cabins. The Research Centre and its hostel-like living quarters share the same bird sightings as Borneo Rainforest Lodge and from the canopy walk, it is possible to see all eight species of hornbills. Black throated Wren Babbler, Bornean Wren Babbler, Bornean Blue Flycatcher, Blue-headed Pitta, Blue-banded Pitta, Bornean Ground Cuckoo, Bulwer’s Pheasant, White-fronted Falconet, Crested Fireback, Chestnut-necklaced Partridge, Argus Pheasant, Oriental Darter. Only a 45-minute drive from Sandakan lies the popularly known Sepilok Forest Reserve and Orang Utan Centre. It is a recognised landmark the world over for its orangutan rehabilitation programme and the sanctuary was established in 1964. 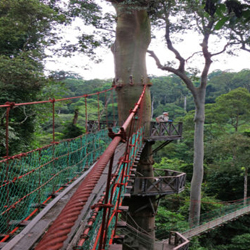 It is made up of 60 sq metres of primary lowland rainforest, but visitors may also explore the surrounding gardens and canopy walk at the Rainforest Discovery Centre, which received its Important Bird Area designation in 2009, (MY29). Those wishing to venture further can take a two-hour walk to the mangroves in Sandakan Bay to look for forest understorey birds or walk along the canopy walkway to view birds and wildlife. Bornean Bristlehead, Blue headed Pitta, White-fronted Falconet, White-crowned Shama, Wallace’s Hawk-Eagle, Oriental Darter, Great Argus, Rufous-collared Kingfisher, Blue-banded Kingfisher, Brown-backed Needletail, Velvet-fronted Nuthatch. 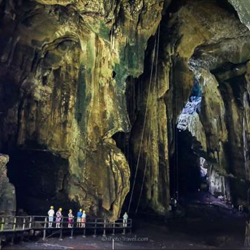 Within the Kinabatangan area, and a two-hour drive from Sandakan are the Gomantong Caves; one of the biggest cave systems in Sabah, and part of the Gomantong Forest Reserve which was gazetted in 1925 and covers an area of 3,000 ha. Gomantong Caves are made up of the black cave which reaches a height of 60m and is easily accessible to the public while the white cave is not accessible as it is much higher and requires caving and climbing equipment to traverse the treacherous terrain. At dawn and dusk, millions of bats and swiftlets swirl around the caves, seeming to take turns as the bats leave at night and the swiftlets settle in, while at dawn the bats come home and the swiftlets leave for the day. Bat Hawk, Peregrine Falcon, Wallace’s Hawk-eagle, Bully Fish Owl, Changeable Hawk-eagle and Rufous-bellied Hawk-eagle. In the centre of the Dent Peninsula in eastern Sabah and 50 km northeast of Lahad Datu lies Tabin Wildlife Reserve. Gazetted in 1984, this amazing area of over 120,000ha is the site of undisturbed forest in the middle of approximately 1,200 sq km of primary and logged lowland forests. Access is limited by the use of four-wheel drive vehicles. Apart from its mammal population, this area is a haven for birds and birders as the secondary forest is not as tall as the primary forest, causing the birds to perch lower, as well as allowing more light through its branches, making viewing, identification and photographing of birds easier. Bornean Bristlehead, Blue-headed Pitta, Black-and-Crimson Pitta, Garnet Pitta, Bornean Banded Pitta, Giant Pitta, Dusky Munia, Black-throated Wren-babbler, Bornean Wren-babbler, Bulwer’s Pheasant, White-fronted Falconet, Bornean Blue Flycatcher, Wallace’s Hawk-Eagle, Large Green Pigeon, Storm’s Stork.